The reverse osmosis system is one of the products and water purification systems that is designed and delivered in industrial dimensions and uses. The process of reverse osmosis or sweetening is a method for separating impurities from water. In this method, the separation is the mechanical pressure applied. At present, reverse osmosis has a very important role in water treatment. The reverse osmosis system is one of the products and water purification systems that is designed and delivered in industrial dimensions and uses. The process of reverse osmosis or sweetening is a method for separating impurities from water. In this method, the separation is the mechanical pressure applied. At present, reverse osmosis has a very important role in water treatment. In reverse osmosis water purification, raw water is pumped through the pump into a chamber with a semi-permeable membrane. Because almost pure water can pass through the membrane, almost pure water is collected on one side of the membrane and concentrated water from impurities on the other side of the membrane. The RO machine can work continuously and can reduce TDS of raw water by up to 95%. Removing bacteria, viruses and other microorganisms by using the reverse osmosis process is roughly 100%. Also, reverse osmosis can remove 99% of minerals and 97% of organic matter and colloidal water. 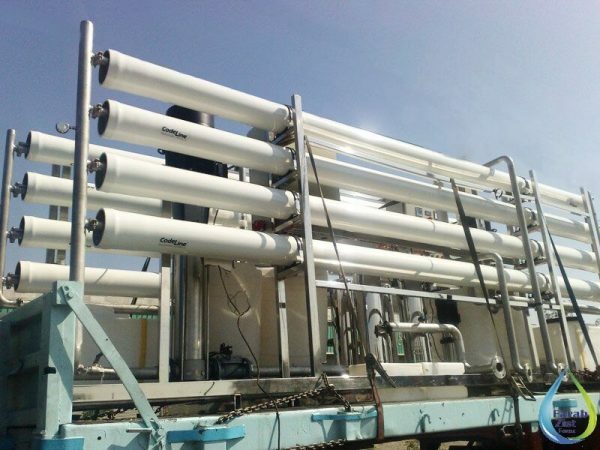 The preliminary treatment of the input water into the RO machine is used to optimally use the membranes and increase the membrane operating time, and during this operation, the water is ready to cross the membranes. The preliminary water treatment operations include the following steps: 1- Separating solid suspended particles: Suspended and colloidal substances in the water cause membranes to crash. The amount of water deposition is determined by the SDI, and its value is less than the limit. To reduce the opacity and poured particles of water from a sand filter and a micron filter with 5 micron pores. 2. Removal of microorganisms: Microorganisms such as bacteria can cause microbial cramps. And even in some cases, the enzymes secreted from microorganisms on membranes have a destructive effect. For this reason, it is necessary to disinfect the water before entering the RO device. A variety of water disinfection methods can be used to disinfect water. If chlorine is used for disinfection due to the effect of chlorine destruction on membranes, chlorine must be removed before entering the membrane, which is done by the injection of meta-sulfite. 3. Removal of organic matter: To reduce the organic load or to isolate the residual chlorine in the input water, use of active carbon substrates. 4. 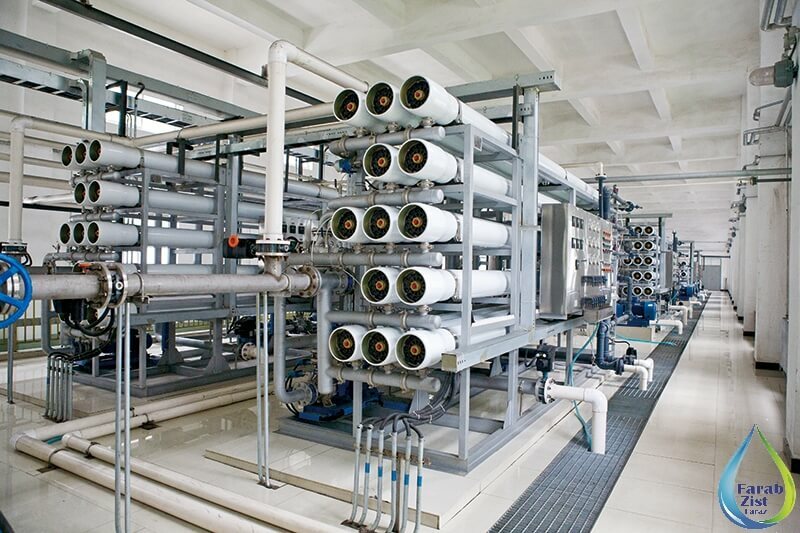 Control of Sedimentation: Oxide oxidizing and oxidizing materials, iron oxides, manganese and silica can create problems during the process of desalination and, as a result, reduce membrane efficiency. Hexa-metaphosphate compound can be used to control sedimentation factors. 5. pH adjustment: Adjusting the pH of water is necessary to increase the membrane’s life and prevent the deposition of some salts. The useful life of membranes decreases at an inappropriate pH due to hydrolysis. 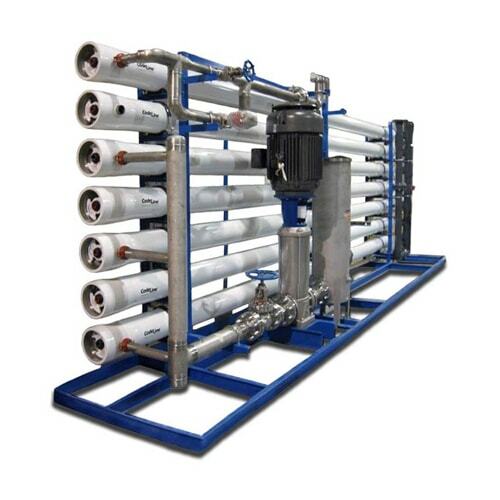 Industrial reverse osmosis purification system includes multifunctional pre-filter, water hardening or anti-coagulation dosing system, chlorination dosing system, reverse osmosis unit with semi-permeable membranes, and UV or chlorine sterilization after purification. These devices use reverse osmosis technology with multimedia filters to drive water intakes and remove particles larger than 10 microns. The water is then injected with an anticoagulant to control the hardness of the water and not damage the membranes inside the device. These pre-treatment options have the ability to remove hardness, chlorine, odor, color, iron, and sulfur. Then the water is transmitted to the reverse osmosis unit in which a high pressure pump enters a very high pressure into a highly concentrated solution. In this way, the remaining salts, minerals, and impurities that the prefilter can not absorb are removed at this stage. Drinking fresh water is released from the membrane’s low-pressure end, while salts, minerals and other impurities are discharged from the other end. Ultimately, water is passed through a UV sterilizer (or after chlorination) to eliminate any bacterial and bacterial residues in the water. The use of reverse osmosis water purification machines is very diverse and includes a variety of industries. The need to supply fresh and drinkable water in many parts of the world has become one of the basic things for societies. In recent years, due to the water shortage and drought crisis in many parts of the world, reverse osmosis filtration systems are used to sweeten seawater and ocean water. Therefore, these water purification systems are also referred to as seawater desalination or saltwater treatment plant. Specification of reverse osmosis purification plant of Farab Zist Faraz Co.
Farab ZIst Faraz Company is also active in the design and implementation of RO water systems. You can contact our experts for more information on the price of the reverse osmosis unit (RO) and the details of the construction and installation of this industrial water purification system.